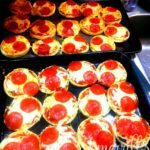 These English Muffin Pepperoni Pizzas are perfect for homeschool lunches! Serve with carrot and celery sticks or a cluster of grapes. This recipe is enough to make 120 of these English Muffin Pepperoni Pizzas. Additional toppings of choice – add your favorites! In my freezer meals prep video, I share several ways you can wrap and freeze these English Muffin Pizzas. Be sure to check that out if you’d like to see the process in action.